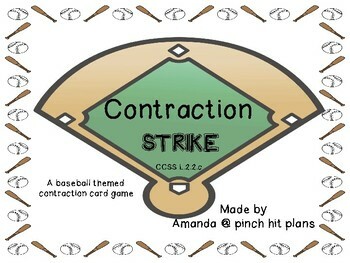 Contraction STRIKE is a fast-paced and engaging contraction review game with a baseball theme. 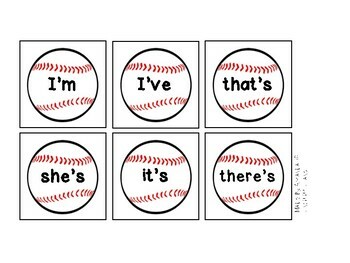 This game is a fun way to review contractions in a small group setting. Players draw cards and need to state either the contraction or the words that make up the contraction (depending on card drawn). If they get the contraction correct, they keep their card. The player with the most cards is the winner. Just be careful, there are STRIKE cards in the deck. 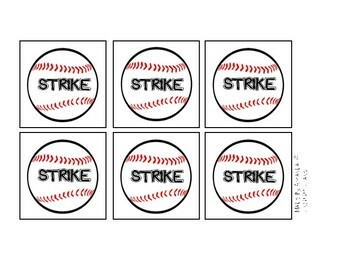 In this game, three STRIKEs and you lose your cards.